Time: Between 8:15 and 8:19 PM Local Time, though the incident in its entirety lasted 32 minutes as the object, tracked by NORAD, crossed a total of ten states. Location: The incident actually began on the east coast, first spotted in Oneida, New York, just outside of Syracuse. It crossed ten states, including Kansas, Colorado and Utah, before disappearing from Nellis Airforce Base radar at 10,000 Feet. Response: The Air Defense Command was alerted after the object was tracked by NORAD. The object apparently landed at one point, confirmed by an Air Force Spokesman. During the 42 minutes it was on the ground, all power was lost from a nearby power station. Power was restored once it left, at which time it was pursued by jet interceptors summoned from Phoenix and Stead Field in Reno, NV. Outcome: Jets pursued the object until it exploded over the Mesquite Range in Nevada "in a brilliant glare that was visible over five states." Witnesses: Having crossed from the east to west coast, the object was seen by literally thousands of people. It has been described as a red or blue fireball; a red-flaming sword across the sky; an object resembling a tadpole; a very bright, white light was a smoke trail behind it with twenty-to-thirty explosions. Witnesses in Utah claimed it was no more than 500 feet above their truck, causing it to nearly stall at the time. "It had a long slender appearance comparable to a cigarette in size, that is, the diameter with respect to the length of the object. The fore part, or the lower part of the object was very bright, intense white such as a magnesium fire. The second half, the aft section, was a clearly distinguishable yellowish color. I would say the object was just about divided in half, the fore part being intensely white, the aft section having a more yellow color to it." Air Force Intelligence Report - April 24, 1962: [1b]At 0319& on 19 April 1962 a brilliant mid-air Illumination appeared over Nephi, Utah, visible in Idaho, California, Arizona and Kansas. One violent explosion and 20-30 sharp explosions followed illumination. AF pilot in area reported clearly defined white object falling toward ground after illumination. Resident of Lynndyl, Utah, stated a bright white object passed over him traveling north-west at 3OO-5OO feet altitude, having bright white trail, turning to smoke trail after object passed. Observers at Jericho, Utah, (39 ^5M, 112 11W) stated object passed east of Jericho in north-west direction. Observer 3 miles south-west of Eureka, Utah reported object passed over in northwest direction, alternately emitting gasping sound, retarding forward movement, and surging ahead three or four times, before flame at tail of object turned from bright yellow to blue. Observer stated object arced over and estimated that object landed in vicinity of M6. 15a(l) Shape - A long cylinderical shape like a cigarette. 15a(2) Sisse - At the distance object appeared to be the size of a cigarette. 15a(3) Color - The forward or lower part of object was a bright intense white. the after half was a clearly distinguishable yellow color. 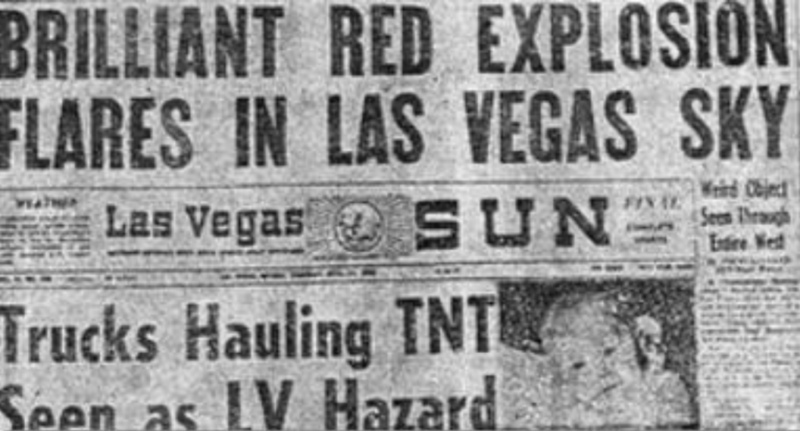 Apparently only one newspaper initially covered the incident, The Las Vegas Sun. Dr. Robert Kadesch, an associate professor of physics at the University of Utah, dismissed it as probably being a "Bolide," an extremely bright meteor. The radar sighting at Nellis Air Force Base initially reported the object as "unidentified," but later changed it to "Insufficient Data For Scientific Analysis."